Listen- I am fully aware of how easy it is to pull out our Smartphones and do a speedy search for literally any recipe we could imagine wanting. But what happened to good ol' fashioned cook books?! The ones you want to set out for display because the covers are just that pretty. With the crisp white pages, revealing proof of delicious meals. Well, we have a few... but they've been packed away for way too long to admit publicly. We haven't needed a cookbook with the Internet at our fingertips and I too, am the 21st Century Mom who Googles (or Pins) anything I "need." So what...?? Just grab your phone, open your Pinterest app and search: "easy chocolate chip cookie recipe." Bam--hundreds of options lay at your fingertips. Click the link, scroll, and voila! But I've missed pretty cookbooks. I had some money left over on an Anthropologie gift card and browsed for a while, searching all their beautiful (and out of my price range) home goods. Then I got to their Book section and saw exactly what I wanted: a baking cookbook, with a cover SO pretty I swear you could eat it. You all know my husband is a self-taught Chef. We don't desire to eat out very often because when we DO, I usually say something like, "Your meals are better," or, "You could do better than that." But I don't cook! Baking is my Sunday afternoon therapy and while the kids are asleep, there's almost nothing I would rather be doing! (Well... except maybe eating whatever it is that's in the mixing bowl!) Today was nothing less. It has been a few weeks since I found something I had the time and energy to bake. If you follow me on Instagram, maybe you saw my brownie post where I followed a recipe from Handmade Baking, by Kamran Siddiqi, well that was two weeks too long ago. Those brownies were from my Anthro book find, a gift to myself, and I am SO glad for the purchase. Last year, pies were my thing, a new pie each month; but this year I claimed cookies. A new cookie recipe a month. I flipped through this sturdy new baking book and found exactly what my taste buds were craving--chewy oatmeal-raisin cookies. I'm not a huge fan of raisins by themselves, but give me the right cookie and I absolutely love them. I adapted Kamran's recipe a little; for one, I added chocolate chips because this girl always needs them in homemade cookies. And I didn't top them with cinnamon-sugar like he does because I just didn't have enough time. Mine turned out divine so gosh, I can only fathom had I taken that next step! Pierson of course wanted to help me this afternoon. So I measured the ingredients that we needed and I let him pour each one into the mixing bowl while I read the recipe. Reese wanted to join (aka sneak some dough) and was super cute trying her best to sit still and not dump egg shells and oats all over the floor. 1. In a medium bowl, whisk together the flour, cinnamon, baking soda and salt. Set aside. 2. In a large bowl with a paddle attachment, beat together butter, brown sugar and granulated sugar until pale and creamy. 3. Turn off mixer, scrape sides and on low speed, beat in the eggs and vanilla. Mix until well incorporated. 4. Add the flour mixture and mix until just combined. Still on low speed, add the oats, raisins and chocolate chips until just combined. 5. Cover the bowl with plastic wrap and refrigerate for an hour or until dough is firm. 6. Preheat the oven to 350° and line two cookie sheets with parchment paper. 8. Bake for 10-13 minutes (I baked mine nine). 9. 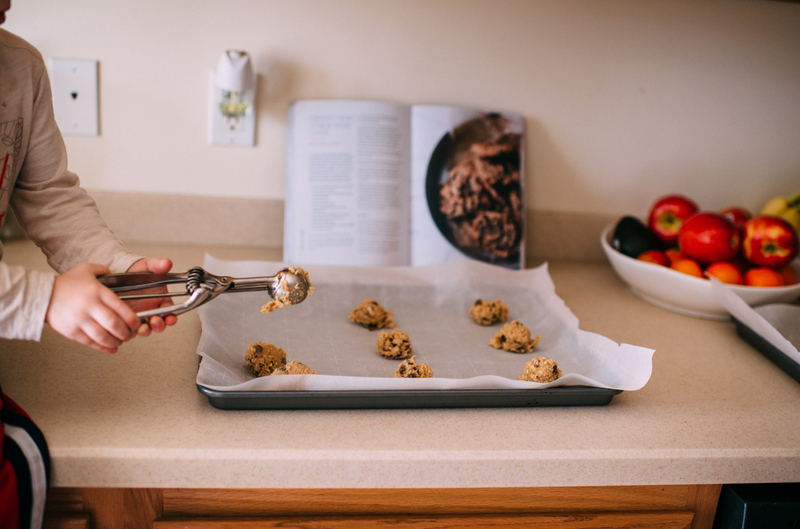 Let the cookies bake a minute longer on the pans once pulled from the oven and then transfer to a cooling rack. 10. Pour yourself a giant glass of milk and enjoy yourself a (or five) soft and chewy chocolate chip, oatmeal raisin cookies!